Malaysian Chess Federation or MCF is currently in the midst of selecting players for this year's Chess Olympiad. 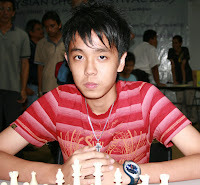 Current National Closed Champion NM Edward Lee (pictured above left) is challenging his bigger brothers for a place in this year's 38th Chess Olympiad to be held in Dresden, Germany from 11th to 22nd November 2008, alongside Runner-up Leong Wan Mun (right). The other players in the Olympiad Selection, based primarily on FIDE rankings and performances in local tournaments are FM Lim Yee Weng, FM Mok Tze Meng , IM Jimmy Liew, Mohd Fairin Zakaria, Ismail Ahmad and NM Lim Chuin Hoong. Four players will be selected in the eight-player format to join Malaysia's top player IM Mas Hafizulhelmi in his quest for the GM title. Three other leading players namely IM Wong Zi Jing, FM Nicholas Chan and FM Anas Nazreen are however unable to compete in the Selection. In the first rounds held last Saturday at The Chess Network, Edward Lee (black) beat Fairin Zakaria while the latter held Mok Tze Meng (white) to a draw. More turnouts are expected on the two scheduled time-slot of 09:00hr to 13:00hr and 14:00hr to 18:00hr this Saturday at the same venue.